Traveling is often stressful when you’re on a gluten free diet. The thought of staying at someone’s house can cause anxiety just thinking of all the opportunities of cross-contamination. 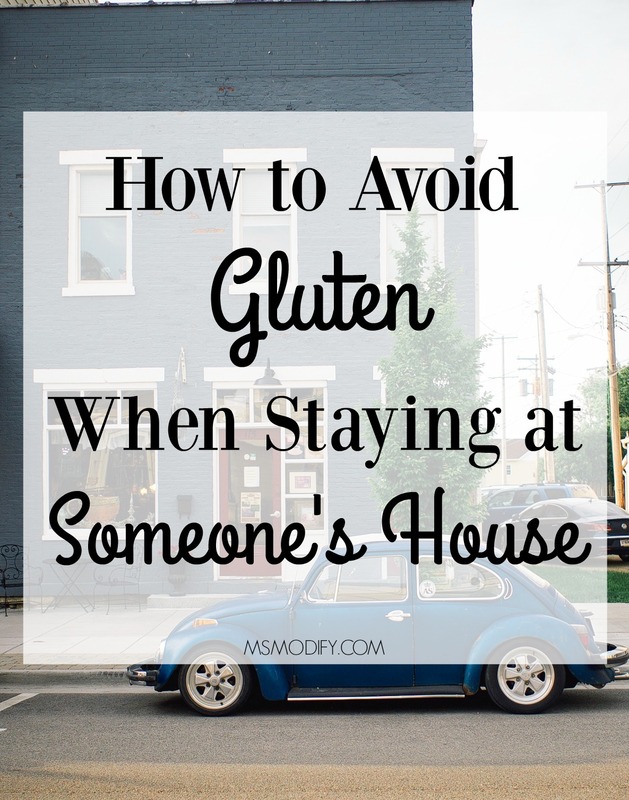 In the past I’ve gotten sick from gluten when staying at others’ houses, so I’ve learned to modify my stay and now I never get sick! Call Ahead and Let Them Know: Just in case your host doesn’t know you’re gluten free, call and let them know and briefly tell them about cross-contamination. This is helpful so they don’t go out and buy gluten containing food or prepare food before you come. If they offer to buy some gluten free food, (so nice of them!) let them know some things to look for. Bring your Own Food: If you’re driving there, pack some of your favorite gluten free food that won’t spoil in the car (bread, pasta, sauces, etc). Once you arrive at your location you should stop at a grocery store and pick up more food to bring. Use a Different Cup: This is especially helpful if many people are staying at the house. In order to prevent cross-contamination, always ask to use a different type of cup from everyone else so there is no confusion. Pots and Pans: If you are driving there and can pack your car full of stuff, I recommend bringing your own pot and pan from home. If your hostess has stainless steal pots and pans, you’re good to cook your own food in them; but if they have non-stick pans it’s better to avoid them (gluten can forever stay on them). If you fly there, you can always go to a local store and buy a cheap pan to use while you’re there. Grilling: You can read my tips on avoiding gluten on the grill here. Make Leftovers: When you cook at the house, make enough to have leftovers for the next day. This is especially helpful to have lunch the next day to bring with you if you leave the house and aren’t aware of where you can eat. If you don’t want to pack a lunch with you, make sure you use my favorite app to find gluten free options to eat out at! Label Everything: Take a marker and write “GF” on everything that is gluten free. This way everyone knows. You don’t want someone who has their hands all over gluten containing food to put their hands in your bag of gluten free chips! Keep Gluten Free Items Together: Keep all your food together in order to prevent cross-contamination. Ask if you can use one shelf of the fridge and pantry for your food. Most importantly, enjoy yourself! Be aware of your food, but as long as you follow these tips you don’t need to stress and can have a great time! Don’t forget to read my other gluten free travel tips! This entry was posted in Travel and tagged gluten free tips, Travel. Another thing I learned was if they do not have a dishwasher and wash everything together in the same dishwater, I get sick. I now bring paper goods to eat off of and to cut up veggies, etc. so I’m not using their cutting boards. It does the trick!